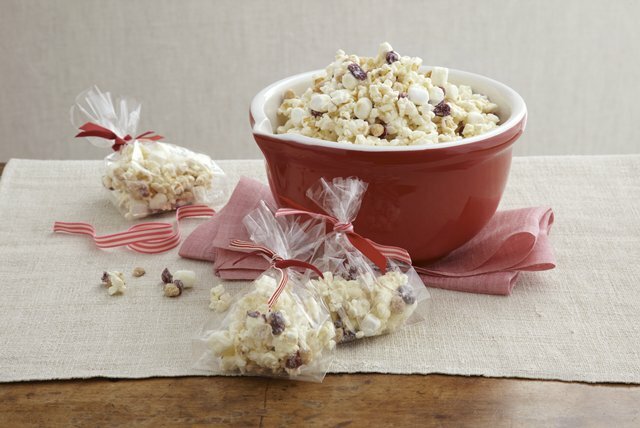 Marshmallows, peanuts, dried cranberries and white chocolate help turn air-popped popcorn into a scrumptious, gift-worthy mix. Combine all ingredients except chocolate in large bowl. Add chocolate; toss to evenly coat popcorn mix. Spread onto baking sheet. Refrigerate 10 min. or until chocolate coating is firm. You will need to pop about 1/3 cup popcorn to make about 10 cups popped popcorn. Package popcorn mix in decorative gift bags for holiday gifts that are sure to win raves from friends and family alike.